Ampthill will take on Bishop’s Stortford at Dillingham Park for a place in National One on Saturday. If successful, the A’s would move into the highest division in their history, becoming one of the top 40 clubs in the country, just one league below Bedford. 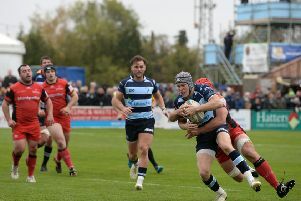 A big crowd is expected for the game that kicks off at 2pm, with Stortford runners-up in National Two South this season, having lost nine games all term, as opposed to Ampthill’s three. There will be a beer tent and barbecue at the club on Saturday, with the normal entry free applying. On Saturday, Ampthill ended their league season with a fine 59-17 win at Stockport. Amps defence was the feature of the first 40 minutes, as Alexander Bloisi opened the scoring in the seventh minute, Joseph Tarrant converting. Tarrant himself then bagged a fine individual try, adding the extras too, before Maama Molitika ghosted through to touch down and Tarrant’s boot made it 21-0. In the second period, Stockport grabbed three tries, one converted, although Brendan Burke’s score kept A’s in front. The visitors were then dominant in the last quarter adding four tries through Tarrant, Darryl Dyer, Karim Lynch and Lee Anker with Tarrant converting three. Leaders Hull Ionians triumphed at Caldy though to ensure Ampthill were second and now head to the weekend’s decider.